My studio has an upcoming in-studio performance that will be live streamed over the web. We're using a fancy Teradek Cube H.264 encoder for the live stream component. We have a Blackmagic ATEM camera switcher allowing up to 4 camera angles. We plan to take this HD-SDI video signal from the output of the Blackmagic ATEM switcher and merge it together with the analog audio out from Pro Tools of the band performing (the H.264 encoder accepts an external 1/8" TRS analog audio input in lieu of the audio signal coming in over the HD-SDI cable). I plan to take the line-level audio output from my HD192's stereo outs and connect it to the Teradek. My HD192 interfaces (16 I/O blue face 192's) appear on my TT patch bay, so with some adapters I've made a dual-mono TT to 1/8" TRS stereo cable for hooking up from the patch bay to the Teradek input! So what's the problem? I'm concerned that if there are any latency issues between the video output from my Blackmagic ATEM and audio output from Pro Tools 10 HD due to buffer size, or real-time DSP processing, then the two signals will be out of sync in our live stream. I've spoken to both BlackMagic and Teradek. They have explained that there is NO ability in either of these units to enter in a "manual offset" to account for the number of milliseconds of delay between the HD-SDI video signal, and the 1/8" TRS audio signal. You know what I mean? They said I have to sync up the two signals BEFORE they reach the streaming encoder. 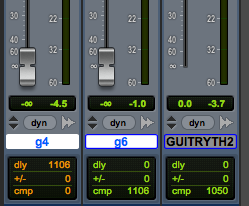 - Use lots and lots of shiny TDM DSP plugins in Pro Tools to mix/master on the fly as the band is performing. EQ/compression on every channel, probably 1 basic TDM reverb and 1 basic TDM delay plugin. Realize that my signal going out to the live encoder needs to be "mastered" at a hot line-level signal, so I would also need to put a TDM limiter and some bus compression on my stereo bus. Lots of real-time TDM plugins in Pro Tools, AND record around ~24 inputs simultaneously. 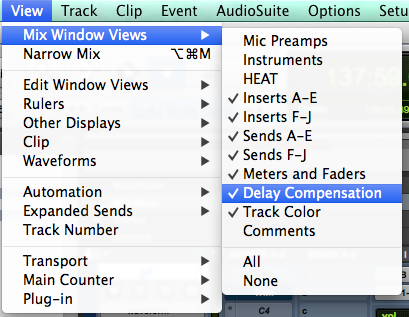 There will be some delay, but turn on delay compensation and Pro Tools 10 HD will sort it all out. - Use as few TDM plugins as possible to minimize latency introduced by these DSP plugins and instead, use LOTS and LOTS of hardware inserts to patch in as much outboard EQ and compression as possible in our 500 series lunch boxes. Hardware Distressors, 1176's, etc. could be used instead of TDM plugins in Pro Tools. This will minimize load on the CPU because of fewer plugins, but will still need a few plugins live in the session like Reverb and something like a TDM version of Waves L3 across the stereo bus. - Will using hardware inserts give me more or less latency as compared to TDM DSP plugins? - I realize if the video signal going into the camera is delayed and is late after the audio signal, then I could use TimeAdjuster on my stereo bus and "nudge" my Pro Tools audio into time with the video! But I am pretty sure my audio will end up being LATE behind my video. Unfortunately using TimeAdjuster on your stereo bus while recording in Pro Tools doesn't work in reverse by forcing your audio to arrive EARLY. conrad787 - Will using hardware inserts give me more or less latency as compared to TDM DSP plugins? conrad787 - I realize if the video signal going into the camera is delayed and is late after the audio signal, then I could use TimeAdjuster on my stereo bus and "nudge" my Pro Tools audio into time with the video! But I am pretty sure my audio will end up being LATE behind my video. Unfortunately using TimeAdjuster on your stereo bus while recording in Pro Tools doesn't work in reverse by forcing your audio to arrive EARLY. I wouldn't bet on audio being too late. In fact, I'm quite sure you will need to delay the audio. 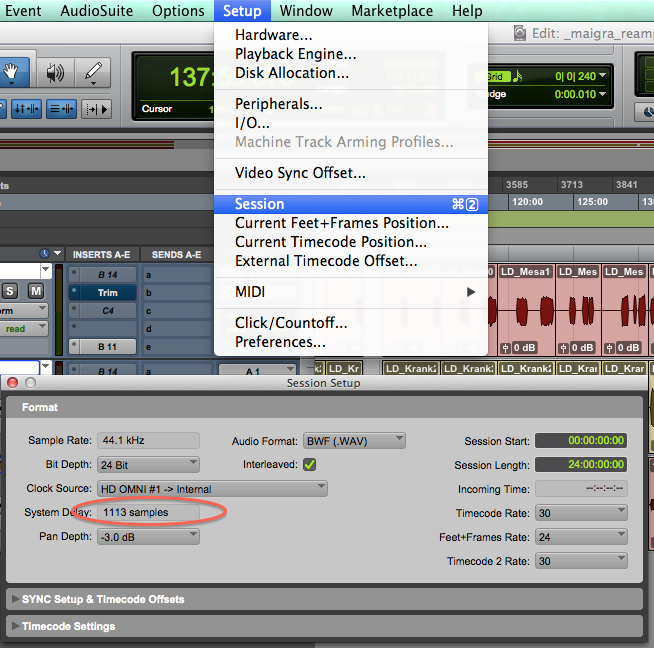 This might be one of those plugins that introduces considerable latency. Massey L2007 TDM will be your friend here.